Progress is being made at the new design-build warehouse Breslin Builders is completing on Sobb Avenue in Las Vegas, Nevada. Now that the walls are stood, the roof framing for the Sobb Avenue Warehouse project is well underway for the project. The structural columns and girders have been placed prior to the roof framing starting. The exterior of the wall panels are being cleaned up and patched. Breslin Builders was selected to provide construction services for the Standard Restaurant Supply remodel at the existing facility at Russell Road and Valley View Boulevard. 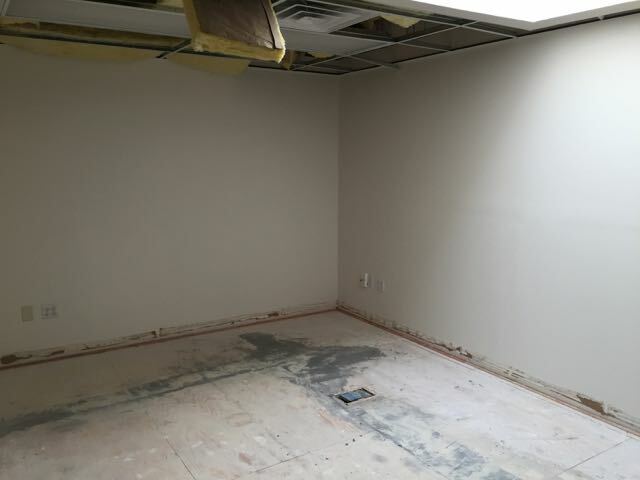 While the scope was fairly simple and included some existing office demolition to open up more warehouse space, cut in new openings in the existing CMU walls, as well as build some new walls for their showroom and sales area expansion, we none the less had to work around an existing operating business. 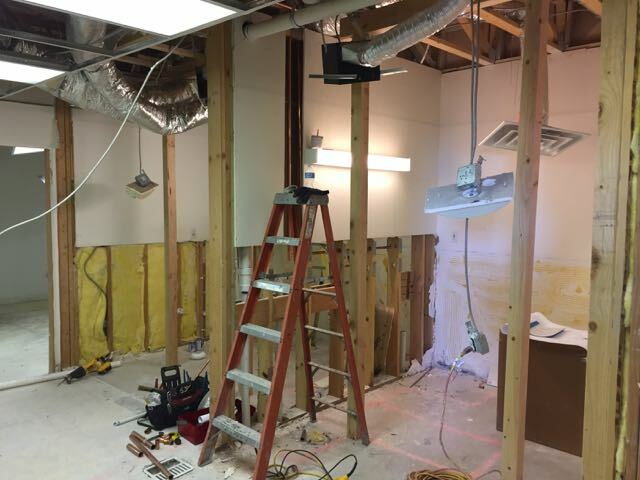 Various methods including dust walls, water misting, and ventilation were used to keep the existing public areas open and safe during the work. The Sobb Avenue Warehouse design-build project is progressing and showing great progress this month. The concrete tilt-up wall panels have been cured enough to be stood in place. Bull Concrete stood the panels over a couple of days giving the building its vertical appearance. Once stood the structural steel and panelized roof framing will begin. Most of the concrete tilt-up panels at the Sobb Avenue Warehouse project have been poured and are curing for placement at the site. Soon the building will start to take shape and the next phase of work can begin, including the steel girders and the panelized roof framing system. Concrete work at the design-build Sobb Avenue Warehouse project is progressing. The slab has been placed and the title-up panels are being formed. Reinforcing and embeds are being placed in each panel also. The slab has been poured at the Sobb Avenue Warehouse project, making way for the concrete tilt-up panels to be formed. The foundation reinforcing is progressing on the new warehouse project Breslin Builders is providing design-build services for. Foundations in areas have been poured. On-site utility installations have started also. Grading for the panel casting slabs have been completed. After many long months and coordinate efforts between the civil engineer, building, and the County, the final permits have been issued from Clark County Building and Safety. The foundation reinforcing is progressing on the new warehouse project Breslin Builders is providing design-build services for. Off-site utility installation for the water line is progressing. Grading work is progressing on the new warehouse project Breslin Builders is providing design-build services for. We are working towards final building department approvals, but we are able to get some initial grading started. In addition to having to import to the site, we also provided on-site crushing efforts to break down the larger caliche boulders found on-site. Breslin Builders has completed the construction documents and recently submitted the Sobb Avenue Warehouse project to Clark County for approvals. We anticipate an April 2018 start pending final Clark County Building Department and Fire Department approvals. An updated rendering of the project is below. Breslin Builders is providing design-build services for a new 32,000 square foot office/warehouse project located in the southwest part of the Las Vegas valley. Located at the end of Sobb Avenue west of Rainbow Boulevard (between Patrick and Post), the project will be a three tenant building with associated warehouse spaces. Anticipated to be constructed of tilt-up concrete walls with a hybrid roof framing system (wood and metal), the project will build on the decades of experience Breslin Builders has on this type of project and construction. In addition to the building, the site will have multiple recessed docks, parking, truck access, and a large trash enclosure. Initial design work has begun, with our next step to including coordination of the land-use approvals with Clark County. We anticipate a Fall 2018 delivery. The Redwood Warehouse project is nearing completion and gearing up for the owner to install their equipment and fixtures to start working the MME cultivation facility. Breslin Builders provided design-build services for the project, converting an existing metal building vehicle storage and maintenance facility into a new MME cultivation facility. Breslin Builders continues our progress on the Westwood Cultivation MME facility in Las Vegas, Nevada. 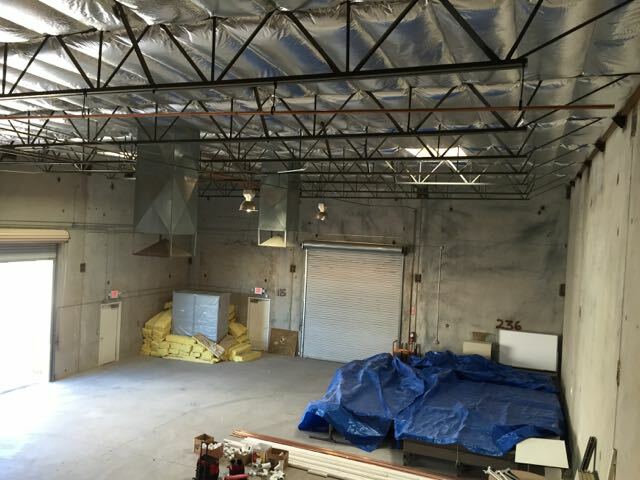 This facility is being located within an existing warehouse structure and will have about 25% over the overall space developed in this phase, with future work and phases to be completed after opening and needed NV Energy power feed upgrades are performed. This is our second MME cultivation project in the works, with others on the “drawing board”. In addition to the cultivation facility, we are also providing design-build services for a fully separated production facility located at the same location. The mechanical, plumbing, and electrical system rough-in installations are taking shape at the Redwood Warehouse MME project in the southwest part of the Las Vegas valley. In addition, the interior and exterior CMU working is taking place also. The Redwood Warehouse MME project, a design-build project, is progressing along with wall framing, mechanical, plumbing, and electrical work taking place. This project will be a medical marijuana cultivation facility. The permits for the Redwood Warehouse project have been issued and the work at the site is starting to take shape. 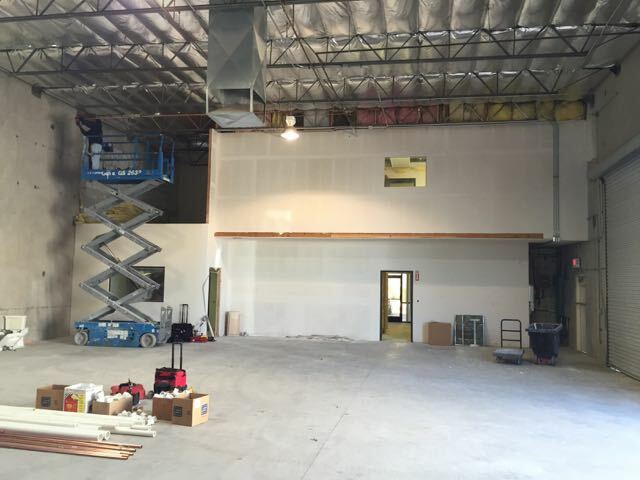 This is one of Breslin Builder’s numerous medical marijuana cultivation facility projects we are current working on. This project consists of the conversion of an existing 20,000 square foot warehouse into a cultivation facility, with Phase I being constructed now and a future Phase II to finish out the grow rooms as needed. The permit for Core3D Centres’ new Las Vegas location has recently been issued by Clark County Building Department and the remodel work can begin. 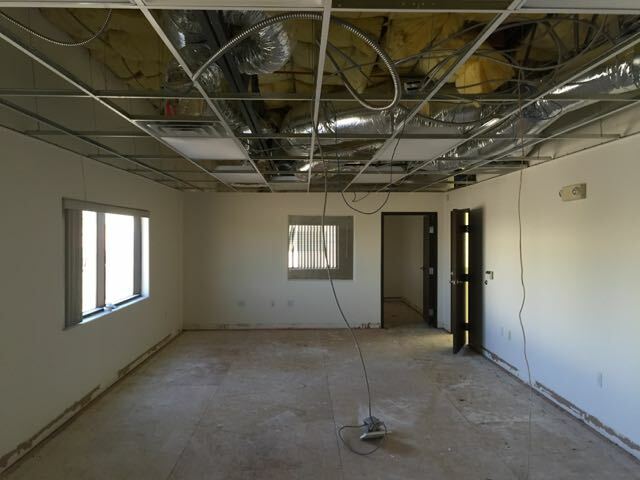 The project is located at 6440 Schirlls Street in Las Vegas, Nevada within an existing office/warehouse building the owner purchased and contracted with Breslin Builders to provide design-build services. Core3D Centres provides various services to the dental industry including manufacture of various types of dental implants, teeth, and other related services and products. They will be moving from their current smaller space into this new facility once completed. Working closely with Core3d Centres, Breslin Builders and our design-build subcontractors (Fleming Air, US Plumbing, and Helix Electric) provided design and engineering services of the new project, including various changes within the space, enlarged restrooms, added control and QC areas, storage rooms, new upper level exit stairs, upgrades and changes to the existing HVAC system, and other areas and items needed to make the existing space with with their requirements. The space will house their various milling and 3D printing machines, as well as computer and support facilities related to their business. The biggest hurdle for the project is the added electrical loads their American and German made milling machines require, which require an upgrade to the main building service, that we are working with Helix Electric and NV Energy to provide. The existing warehouse will be refinished and upgraded with full air conditioning in place of the existing evaporative cooling system. New finishes throughout the project are being provided, as well as new exterior painting. We anticipate this project to be completed early summer. More information about Core3D Centres can be found here. Downtown Container Park – Coolest Playground in the US!